From more manic footballing transfers, to cricketing meltdowns, playoffs and more, its been a fitting month to kick-off 2014 in sport. 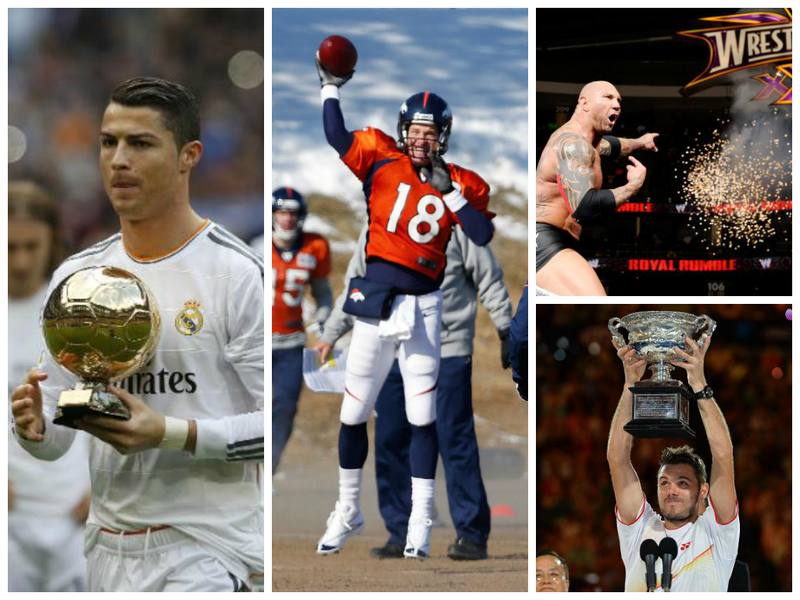 In this article, we take a look back at the best news stories and biggest sporting events for the past month of January 2014, including the best football news, stories from cricket, American Football, Basketball, Wrestling, Mixed Martial Arts and Formula One. Football in January was one heck of a way to start the year. From the first game of the year between Manchester City and Swansea on New Year's Day, it really set the tone for a great month of football. It was a table-topping month in the Premier League. Arsenal, Manchester City and Chelsea emerged as the real frontrunners in the title race, taking advantage of some bad results on each other's parts along with the teams battling for European competition, if not higher. Chelsea beat Liverpool by a goal in a tight game where refereeing could have played a pivotal role in the outcome, before the Reds went on undefeated for the rest of the month, along with a thrilling 5 - 3 win over Stoke City, and a demolition at the Merseyside Derby, defeating Everton 4 - 0. Meanwhile, Manchester United had an apparent answer to their woes over the New Year, acquiring Juan Mata from Chelsea for a near-£40m deal. The Spaniard would get an assist in his first game for the Champions. The deal was made over a week after Chelsea dominated Manchester City in a 3 - 1 victory. Manchester City finished the month on top of the table, taking advantage of Arsenal's draw with Southampton, and beating Tottenham 5 - 1 to reach the summit of the league. A few days into the month and Cristiano Ronaldo won the FIFA Ballan d'Or Player of the Year award, seeing off Franck Ribery and Lionel Messi for the prestigious award. Earlier on, an emotional Pele accepted a monumental award, the Ballan d'Or Prix d'Honneur. In the Capital One Cup, two finalists in Manchester City and Sunderland would emerge. Manchester City eased their way past the Hammers with a 9 - 0 victory on aggregate. Sunderland would stun Manchester United in a game going down to the wire, and then to a very lackluster (and that's putting it nicely) penalty shootout, where the Black Cats sealed the date with Manchester City in the final at Wembley. Meanwhile, the League Cup picked up steam with the bigger clubs being introduced. With Manchester United eliminated, Man City, Liverpool, Arsenal and Chelsea were some of the big clubs to go through, with them surprisingly to be pitted against each other in the next round. In the rest of the football, controversy about Neymar's transfer to Barcelona would shadow the Spaniard's football over the month, La Liga's title race would finish with a point between the top three teams and we geared up for a big year of football. Things got worse for England in January's cricket, as their problematic Australia tour stole many-a-headline. Coach Andy Flower would resign after the humiliating defeat down under, with Alistair Cook's captaincy also being brought into question. England showed glimpses of their original quality, but remained far from it. As Andy Flower said, England really do need a "fresh start". India also battled New Zealand while Bangladesh and Sri Lanka squared off in International cricket series as the team prepared for the year of the Cricket World Cup. This month, we got our first look at the new F1 cars and saw them in action. With an aim of making the sport safer and more "greener", cars were made more efficient and in practice questions were surrounding a debacle of a very open season come March. Last season's Champions Red Bull had a troublesome start to their practice, with a crash in their first session along with Mercedes' Lewis Hamilton also getting his car wrecked. It's clear. F1 changes will take a lot of getting used to. Also, Formula One fans were keeping track of Michael Schumacher's condition following his Skiing accident at the end of last year. Doctors were slowly taking him out of his coma as the month came to an end. In their 33rd encounter, Rafael Nadal and Roger Federer battled in the US Open Semi-Final, with the Spaniard Nadal defeating his Swiss rival. However, Stanilas Wawrinka would triumph by defeating the Spaniard in a great final. An 'exhausted' Wawrinka would next win in the Davis Cup First Round tie. Denver Broncos and Seattle Seahawks sealed their date at MetLife Stadium for the SuperBowl as they prevailed in the Playoffs. San Fransisco 49ers would blaze their way through to the Divisonal Championships, only to crumble in the Fourth Quarter to the Seattle Seahawks, the #1 seed in the conference, as they secured their place in SuperBowl 48. Peyton Manning lead the charge for the Denver Broncos as they saw off the Chargers and Patriots to get to the SuperBowl. In what could have been the coldest SuperBowl in history, the two #1 seeds were poised to battle it out, amid talk all week long of the possible date of the game being moved. In a month where the NBA regular season passed it's midpoint, Carmelo Anthony would score sixty-two points in a game, Kevin Durant would state his intent for MVP, NBA Commissioner David Stern stepped down and there were plenty of big games. Brooklyn Nets saw off last season's Champions Miami HEAT, and also went on a five-game winning streak after a routing the Atlanta Hawks when the NBA featured a regular season game in London. Carmelo Anthony set a franchise record for most points in a single-game when he scored sixty-two points in a blowout against the Charlotte Bobcats, as the Knicks looked to get back on track after a recent slump on form that also featured a heavy loss on NBA's special games lineup for MLK Day. On that day, Hawks also defeated the HEAT and Taj Gibson's overtime buzzer-beating game winner saw off the Bulls at the United Center. In NBA's first Sunday showcase of the season, Carmelo Anthony would put up thirty-five points as the Knicks saw off Lakers. Earlier, the HEAT dispatched NBA Finals' opponents San Antonio Spurs with a third quarter runaway and standout performance by Chris Bosh. Rajon Rondo returned for the Boston Celtics just a week-shy of one year from his injury, where he tore his ACL. Rondo and the Celtics took time to get back to winning ways following the departure of key stars. It was a TD Garden reunion on GRAMMY Sunday, as Kevin Garnett and Paul Pierce made an emotional return to the Celtics' arena with their team defeating Boston 85 - 79. Oklahoma City Thunder would indeed extinguish the HEAT, taking the Champions by storm in a 112 - 95 victory, as Kevin Durant made his statement for MVP where he outclassed LeBron in the game. Other notables included Terrance Ross' 51-point game for the Raptors, and huge trade rumours, only to be replaced by not so big trades in the month. January featured three fight cards in the UFC, starting with Singapore's fights headlined by Saffiedine and Lim. A gutsy performance from Lim would go the distance, almost on one leg at times, but Saffiedine would triumphantly be raised the victor. Luke Rockhold reminisced of his Strikeforce days of dominance with a first round TKO of Costa Phillipou in the UFC's Wednesday night fights in Atlanta. Rockhold landed a body-kick that would ground the Brazillian before Rockhold one with the referee's stoppage. Benson Henderson won in controversial circumstances against Josh Thomson with the UFC taking over Chicago. Conflicting whether it was a good call or not, Henderson took one step towards another shot at the Gold. There were encouraging updates on Anderson Silva, as Dana White stated that Silva could be fighting by the end of the year and was healing well. UFC's SuperBowl weekend card was set to go with two title fights to start the month. WWE: Road to WrestleMania Begins, Batista Returns, CM Punk Leaves WWE? Its the time where the WWE really kicks off. Royal Rumble 2014 saw Batista - who returned a week prior - see off a record-breaking Roman Reigns in his final elimination to secure a WrestleMania 30 Championship match. The tag team Championships also changed hands to the New Age Outlaws, who lived out a resurgence with the Authority. Brock Lesnar ran riot through WWE, demolishing The Big Show and boldly claiming his contender-ship for the WWE strap. Old School Raw took place with many WWE Legends returning, most memorably Jake "The Snake Roberts". WWE paid tribute to one pioneer in wrestling, Mae Young, who wrestled in eight different decades, passed away in January. One of the WWE's biggest announcements, the launch of the WWE Network had critics sounding off about their groundbreaking initiative, with it set to launch in February, the WWE Network will provide unprecedented wrestling content for the WWE Universe. Other storyline features from the WWE were the Wyatt Family ruining John Cena's opportunity, Kaitlyn leaving WWE and things being put in place for WrestleMania. Possibly the biggest and most overshadowing story in the WWE was the alleged departure of CM Punk from the WWE. Numerous reports stated that the former WWE Champion walked out following the Royal Rumble as he was frustrated at WWE's creative choices and screwing out the hard workers. Whether this is a work, or actual real, time will tell. Well that is all for January in the sporting World. Keep checking TheSportMatrix for plenty more sporting coverage, reports, analysis, opinion and much more. A full review for all the sports in January 2014, including American Football as the SuperBowl neared, soccer with the Ballan d'Or, and much more.